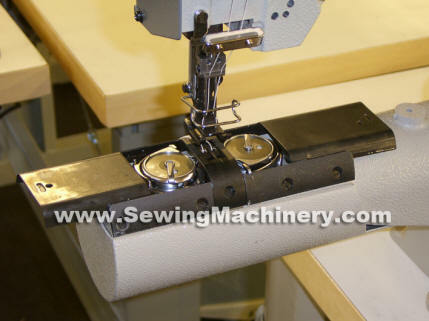 Highlead GC2268-2B twin needle cylinder arm compound feed walking foot heavy duty sewing machine (bottom feed, needle feed and walking foot feed) with 2x large Vertical axis hooks. The GC2268-2B features an 83mm diameter heavy duty cylinder arm shape for use in production of 3 dimensional items and tube shape goods like filters etc. Examples: filters, leather products, bags, luggage, seats, straps, technical textiles, upholstery and wherever you need a cylinder arm heavy duty industrial sewing machine with walking foot and twin needle stitching. The 2x large vertical hooks and bobbins offers twice the normal thread capacity, reducing bobbin change over and idea for use with thicker threads and materials. The presser foot has a high lift of up-to 16mm, allowing for a large range of medium and heavy weight materials to be used. A safety slip clutch is fitted as standard to help prevent damage to the hooks, gears and other important parts, should the machine become jammed or over-loaded.